Global venture capital funding in digital health set a new record in 2018 with this amount raised in 698 deals, a 32% increase from the previous record set in 2017 of $7.2 billion in 778 deals, according to a Mercom Capital Group report. This percentage of health care executives indicated they will invest in patient engagement technology in the next three years, according to SAP. In 2016, the medical records of 1,654 patients treated by Virtua Medical Group doctors became publicly accessible through Google web searches due to a security lapse by Best Medical Transcription. The breach will cost the now-defunct consulting company this amount and its rights to run a business in New Jersey, says the New Jersey Attorney General’s Office. According to Mercom Capital Group, the highest funded digital health category in 2018 was data analytics with this amount, followed by mHealth apps with $1.3 billion, telemedicine with $1.1 billion, mobile wireless technology companies with $847 million, clinical decision support with $714 million, and wearable sensors technology companies with $703 million. According to an Office of the National Coordinator for Health Information Technology data brief, a majority of hospitals use more than one electronic method to routinely send (this percentage) and receive (61%) summary of care records with outside organizations. However, one-quarter of hospitals are not using any electronic method to routinely receive summary of care records. 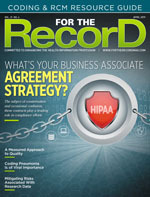 According to a survey by KLAS Research and the College of Healthcare Information Management Executives on the current state of the medical device security industry, only this percentage of HIT executives said they were very confident or confident that their current strategy protects patient safety and prevents disruptions in care. A survey by SAP found health care executives’ top challenges are declining reimbursement (this percentage), the patient experience (53%), maintaining and upgrading IT (48%), and cybersecurity (46%).